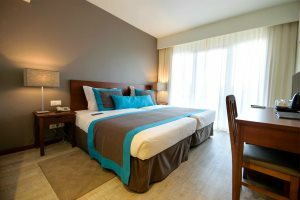 Situated on the rocky coastline overlooking the ocean and two bays of black volcanic sand, Oasis Praiamar offers guests a fine base from which to explore Santiago. The Panorama bar at Praiamar has the best location! Enjoying evening drinks before dinner on the water’s edge is lovely. The beach at Prainha is just a five-minute stroll from the hotel. A small beach that is very popular with the locals for their morning swim. 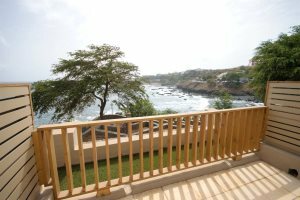 Located in a residential area of Praia, the Oasis Praiamar Hotel is perched on a rocky headland overlooking the bay of the same name. An established hotel, this is a fantastic choice for guests who are looking to spend time relaxing by a large pool or exploring the local area along with Cape Verde’s history. During the evening, you’ll find that the hotel’s Panorama bar is an ideal spot to enjoy a pre-dinner drink whilst overlooking the Atlantic Ocean, and to add an extra touch of atmosphere, there’s live music most weekends. 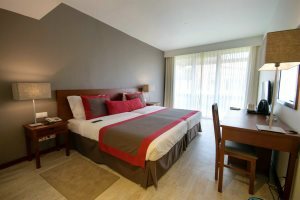 The location of the Oasis Praiamar makes it an excellent base from which to explore the island of Santiago and its capital, Praia. Guests can wander traditional African markets, learn much about the island’s and archipelago’s rich history, plus enjoy a variety of authentic restaurants and the vibrant nightlife. For those who are in search of a little more adventure, this hotel is an ideal choice for spending a few nights before journeying across to the magnificent island of Fogo. Your international flights are direct to Sal, then internal flights to/from Santiago. 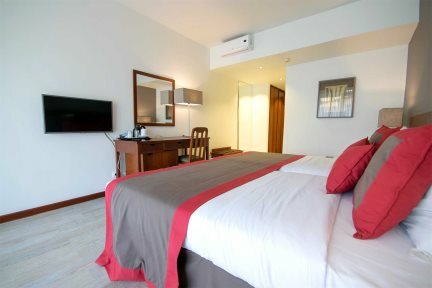 Santiago is best experienced as part of a multi-centre island hopping holiday around the archipelago. Call one of our experts about a tailormade itinerary. 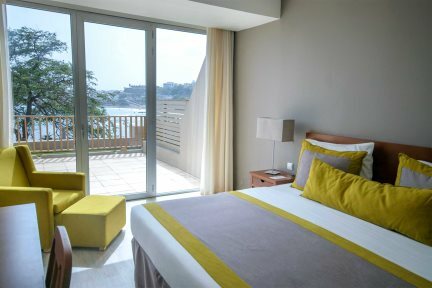 Standard rooms have double beds, with a balcony or terrace. Sleeps 2 adults + 1 child. These rooms have either twin or double beds and also have a slightly larger patio. These rooms have either twin or double beds, a slightly larger patio and a sea view.